There are always those recipes that call for a tablespoon of this, a dollop of that or a quarter cup of an exotic or rarely-used ingredient. Said item then sits in your refrigerator, ducking behind those everyday stars – like milk and orange juice – just taunting you to make use of it before it morphs into a science experiment. The latter is usually the way those things go over here. But there are those rare moments when I become this resourceful (not wasteful) keeper of the kitchen. 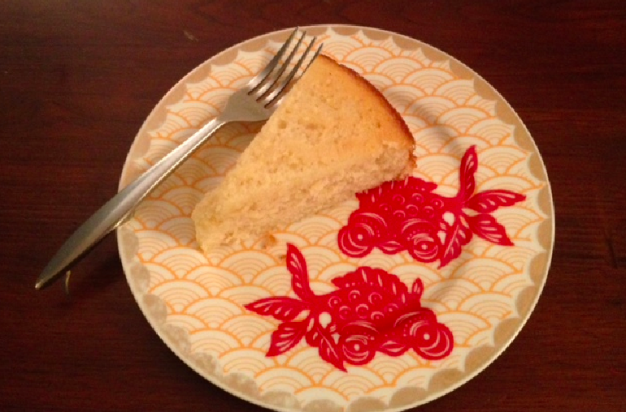 And so I had to share this recipe for a lemon buttermilk cake that saved me from dumping the creamy remains of this icebox lurker. It’s spongy, lemony and all-around delicious – the only thing I would change is to double up on the glaze. With the dairy-heavy ingredients, I have this vision of this recipe as one handed down between the generations of a farming family. Somewhere out in the Midwest, on a green patchwork of well-tended fields, the creamy batter would be stirred with love and efficiency in a farmhouse kitchen, and placed in a window to cool only just until a small hand couldn’t resist crumbling off a corner any longer. Agrarian roots or not, this is a darn good cake, and perfect excuse to use the leftover buttermilk taking up space in your fridge. This entry was posted in create and tagged Chef Dianne Rossmando, cooking, Epicurious, food, lemon buttermilk cake, recipe by lhouse. Bookmark the permalink.